It is now estimated that millions suffer from hormonal imbalances. Until recent decades, hormones and how they work have be shrouded in mystery. But no more! Stephainie Gray is the first certified BioTe provider in the state of Iowa to offer bioidentical hormone pellets. She is the only nurse practitioner and one of only a few individuals in the state of Iowa certified through the American Academy of Anti- Aging Medicine’s Board of Anti-Aging Health Practitioners (ABAAHP). 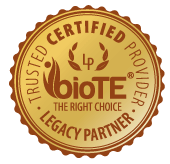 Integrative Health and Hormone Clinic was the first provider in Iowa to reach Legacy Partner Status with BioTE! Studies have shown that balanced hormones are necessary for good health and disease prevention for men and women as we age. BioTE® optimizes hormone levels with tiny pellets placed under the skin that release bio-identical hormones into the bloodstream based on cardiac output. These safe, bioidentical, naturally-occurring hormones help your body to: regain energy, muscle strength and increase mental clarity, feel younger and happier again and increase your quality of life while preventing age-related illnesses. How do you know if you're a candidate for hormone replacement therapy? Symptoms may vary widely from depression and anxiety to night sweats, sleeplessness, fatigue and even low libido. Your blood tests will determine your hormone levels. Your provider will combine your labs with symptoms and once it’s determined that you're a candidate, we will schedule an appointment for insertion of the hormones. Schedule a consultation for BioTE® today! After the age of 30, most individuals’ produce 3%-10% less hormones each year. Many individuals needlessly suffer because they don’t know they have low hormone levels and that safe options like BioTe exist. BioTE® is a bio-identical (not synthetic) hormone replacement that seeks to return hormone balance to youthful levels. In addition to improving energy and muscle strength, providing greater ability to lose weight and increased mental clarity, BioTE® can make patients feel younger and happier again, with an increased quality of life. Optimized hormones can also reduce the risk of many age-related health issues such as osteoporosis, Alzheimer's, and diabetes. Small BioTE® hormone pellets are placed under the skin and release bio-identical estrogen and/or testosterone consistently into the bloodstream. No stitches are required and patients may return to work immediately following the procedure. Proper dosing is determined by your bloodwork and unique and customized dosing is recommended for each patient to provide the best possible outcome. A four-six week follow-up blood test is required so we may evaluate your levels to determine if any adjustments need to be made. Patients already on a hormone replacement treatment such as shots, creams, patches or pills may easily transition to BioTE® hormone replacement therapy. To learn more about BHRT (Bioidentical Hormone Replacement Therapy), visit the websites below and watch the video. Don't suffer any longer. Find out how BHRT can help you by calling our office at (319) 363-0033.